The story below is an original version of my travel story that ran in the March 2012 issue of International Living Magazine. Although we’ve detoured since this was written, we hope to return to South America before long. We enjoyed Chile top to bottom, from the Atacama desert to Patagonia, from the coast to the wine country. For many years it was the “Jewel of the Pacific,” and even today, long after the port’s Golden Age, the brightly-painted hillside houses, cobblestone alleyways, and winding streets of Valparaíso are among the country’s most enchanting finds. Just 75 miles northwest of the capital, Santiago, “Valpo,” as the locals call it, was once an important stopover for ships traveling from the Atlantic to the Pacific Ocean. Immigrants from England, Italy and Germany settled here and left their mark on the city’s architecture and culture. But with the opening of the Panama Canal the ships stopped coming, the port declined, and the wealthy families left. The historic town—a UNESCO World Heritage site—is a creaky, hilly jumble of stone, stucco, and wood-framed homes, reflecting Valparaiso’s stop-and-go historic progress. Few signs remain of the Spanish traffic of the 1500s, nor the 19th-century industrial boom. Instead, due to an earthquake in 1906, the town is a hodgepodge of 20th-century styles. We were met with stormy weather and lots of rain. Dodging waterfalls down the steep cobbled passageways, we found a popular lookout point on Paseo Gervasoni. From here we could see the sweep of the bay and ships bobbing at anchor. Nearby is the Art in Silver Workshop, with sleek designs in silver and local Lapis Lazuli. The quirky Casa Mirador de Lukas offers cartoons and drawings by Lukas, a well-known political satirist for the local newspaper. At the far edge of the hill we stopped for a leisurely lunch in The Brighton, a funky hotel and pub with a nice patio overlooking the port and nearby hills. 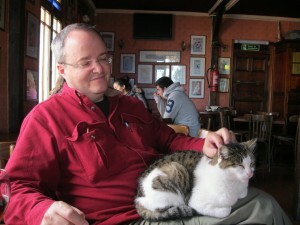 We relaxed with a bottle of wine and a plate of cold cuts for under $20, and made friends with the cats. When the wealthy left Valparaiso they didn’t go far. 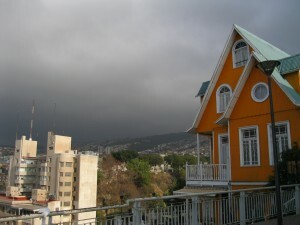 Just three miles down the coast is Viña del Mar (“Vineyard by the Sea”), a newer town and popular center for summer and weekend tourists from Santiago and beyond. The Enjoy Casino is one of the few gambling establishments in Chile, in a town which boasts one of the first casinos in all of Latin America. In this spacious, luxury casino, I opted for a glass of delicious local wine, my book, and a comfortable perch, eventually moving around to hear live music and visit one of the restaurants. Tom, meanwhile played poker. After a couple hours, he had won enough to pay for our Hotel Da Vinci back in Valparaiso and the return taxi, if not the $350 rooms in the casino hotel. The next morning we took a rental car (about $145 for the weekend from Europcar) north toward the village of Zapallar to visit more off-season coastal areas. Passing through Reñaca and Con Cón, a funky little resort town where we’d spent a week in the sun earlier in the year, we admired the wild surf. We pulled over to watch sea lions battling waves crashing onto the rocks interspersed along the sandy beaches. Zapallar is beautiful new place for old money. The town’s original homes are weathered bungalows or sprawling shingle-roofed cottages with pristine gardens nestled into the hills, similar to New England’s coast and suburban areas. Now it includes second homes for the upper crust of Santiago. Following our noses and the most traveled street down to the beach, we ended up right alongside the water at a restaurant called Chiringo. It turned out to be one of those happy accidents of traveling. The restaurant’s electricity had been knocked out. It was packed to the gills with locals taking refuge from the storm. The wind and gray waters were offset by a well-stoked fire in a huge stone fireplace, by candlelight in the kitchen, and by a steaming meal of seafood. We dined on fresh razor clams topped with Parmesan, and a seafood soup with mussels, scallops, clams, shrimp, red peppers, and congrío (conger eel). With a bottle of wine and tip, the meal came to about $63. 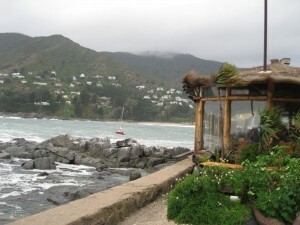 On our last day we traveled in the opposite direction, south from Valparaiso to visit Isla Negra, where the famous Chilean poet and statesman, Pablo Neruda, once lived. The 50-mile drive between Valparaíso and Isla Negra cuts through dense pine forests, across rushing rivers, and curves around mountains and estuaries. The poet’s seaside house is open to the public. (Isla Negra is tiny town, not an island.) The boat-like architecture of Neruda’s home favors small doorways, porthole windows, low rounded vault ceilings, and a ship’s sturdy floor. It’s said that Neruda wanted the drama of being at sea, without actually being at sea. I didn’t want to leave the dramatic views out over the rocky coast. Lingering beside Neruda’s grave, I leaned into the wind, and imagined living here.